Though the Columbia Falls Aluminum Co. plans to stop production at the end of July, the company will continue to negotiate with Bonneville Power Administration, hoping that the plant can reopen in the future, spokesperson Haley Beaudry said Monday. "In our mind, this is not a shutdown," Beaudry said. "This is a curtail on production right now." Two weeks ago, Columbia Falls gave its remaining employees, which now amount to fewer than 90, notice that the plant would close in 60 days for financial reasons. The plant had announced plans to close back in December; then a deal with Bonneville Power kept it operating longer. Beaudry said the company again was on the verge of stopping production earlier this spring, but was able to extend that period through part of the summer. 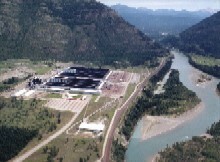 Currently, Bonneville is in the process of setting electricity rates for the next two federal fiscal years - starting this September and continuing through September 2011. The agency is in the midst of a lawsuit brought by various companies in the Northwest who say its rates are too high. Columbia Falls is part of the suit and will continue its involvement, Beaudry said. Beaudry said the aluminum company will negotiate diligently with Bonneville for as long as it takes to reach a deal on electricity rates. Bonneville spokesperson Nanine Alexander would not give any details about current negotiations between the power agency and Columbia Falls, but said Friday that, in general, the administration is working with all of its customers to keep rates as low as possible.